Singapore -- In Osamu Tezuka’s ‘Buddha’ comic book series, controversial themes is depicted towards the end of the fourth book, and adapted into ‘Buddha 2', part of its animated trilogy. The book’s scenes are summarised below, followed by commentary on why they are all seriously wrong depictions of the life story of the Buddha. Scene : An old man comes to congratulate the Buddha, announcing that the Buddha is now enlightened. Corrections: While gods who were aware of the Buddha’s enlightenment did come to honour him, he did not need be told that he had become supremely enlightened. Full enlightenment, after all, is the very state of having realised total awareness of all truths of the universe, what more to say, of one’s own state of mind. 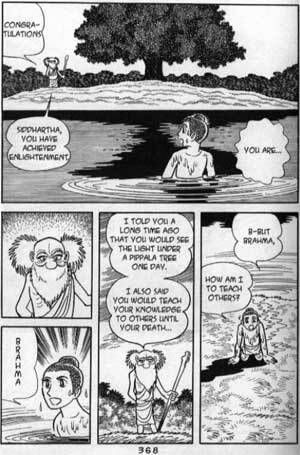 This scene suggests that the old man (Brahma) is spiritually superior to the Buddha, as he was more aware of him being enlightened than the Buddha himself. The truth is, in Buddhism, the Buddha is really a ‘Teacher Of Humans And Gods’, whom even great gods pay homage to, and listen to for learning the Dharma, as they are yet to be enlightened like him. Scene : The Buddha does not recognise him and asks who he is. The old man looks on in silence, as if in exasperation. The Buddha suddenly recognises him as Brahma. Corrections: As the Buddha has total mastery of his mind, which maximises all possible supernormal powers, including the ability to read minds directly, it is impossible for the Buddha to not recognise anyone. Scene : Brahma says he had predicted to him long ago, that he would attain enlightenment under a Pippala [Bodhi] tree and teach many till his death. Corrections: Only other Buddhas, being also equally supremely enlightened, are capable of conferring accurate predictions of when and how someone will attain Buddhahood, and what they will do thereafter. Also, the Buddha never died later, as he had already attained total liberation from the cycle of birth and death. The Buddha entered parinirvana instead, which is the relinquishment of his body, for manifestation elsewhere to teach with his endless compassion and wisdom. Scene : The Buddha kneels, stammers in sweaty desperation, and asks how is he to teach others, saying he cannot get anyone to understand what he had awoken to. Brahma replies that he should still teach. Corrections: The Buddha, being supremely enlightened, would never prostrate before any lesser being. He would also not express lack of confidence or doubt in his own abilities to facilitate the awakening of others. As such, he would not need any vague, unhelpful and commanding instruction of any unenlightened being to urge him to do what he definitely will – to teach, with his perfect compassion for all beings and perfect wisdom on all things. Scene : Breaking out in more cold sweat, the Buddha says that as the world is crooked and people are jaded, no one will listen. Brahma replies firmly again, that he can do it. The Buddha again says he is not sure he can. Corrections: According to the Ayacana Sutta, the Buddha was fearlessly surveying the world for who he could teach, when the anxious and sincere Brahma Sahampati, the highest Brahma god of the form heavens, came to invite him to teach those who are ready. This expresses how even the greatest god of a world system will honour the Buddha and treasure the precious Dharma he has to offer the world. This is the direct opposite of a god repeatedly talking down to the Buddha, as featured. It should be noted that Brahma Sahampati is not Maha Brahma, who is a much lower god, whom, according to the Buddha’s further teachings, mistaken himself to be the creator of the world. Scene : Brahma points at the Buddha and blazes upon his forehead his ‘urna’, as he holds his head in agony. Brahma vaguely says ‘This is the sign.’ As the Buddha looks up in shock, Brahma says it is a holy sign, that now on, he will be called ‘Buddha’, and be called so by others. Corrections: As the urna is one of the Buddha’s 32 magnificent physical characteristics, from where he is capable of radiating his light of compassion, it arose naturally upon attainment of Buddhahood, not forcefully and painfully ‘given’ by any lesser being. As we can see in the Dona Sutta, since the Buddha clearly knew he was fully awakened to perfect compassion and wisdom, he was the one who personally called himself ‘Buddha’, which means ‘awakened one’. Scene : Turning to leave, Brahma again says the Buddha will teach others for the rest of his life. The Buddha, still kneeling, reaches out to him, asking him to wait, again saying that he cannot teach. Brahma says farewell and disappears in a blaze of light. Corrections: In this last scene, the Buddha still expresses existential fret and fear. However, having become fully enlightened, the Buddha does not have any of the all too typical human weaknesses above. If he does, how is he much different from us? The most severe misgiving was to depict the Buddha as being lesser than a god, which displaces his supreme spiritual nature, which is the basis of why Buddhists go to him for refuge. Merely from three pages from the series, the above illustrates but the tip of the iceberg, of a long list of many other misrepresentations of the life and character of the Buddha, and that of other historical persons who arose in his time. Please do not imagine the comics and its animated versions come even close to telling the true story of the Buddha. 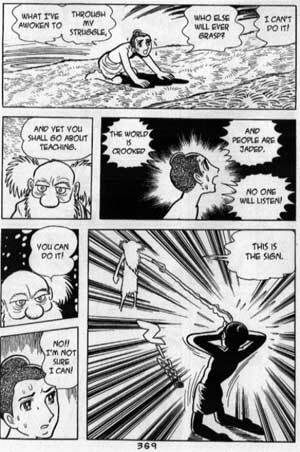 As above, it is almost as far away from the truth as it can get at times – for Tezuka did not even get the spiritual status and character of the Buddha right, much more to say his actual teachings. With overboard creative licence, Tezuka’s ‘Buddha’ is destructive with its wrong depictions of the Buddha and Buddhism, capable of confusing many who are new and unfamiliar with the Buddhadharma. Sadly, such commercialised distortion of the Buddhism is prevalent. As true Buddhists, we must be certain not to promote such misconceptions, and to correct them instead, for no one should be more responsible and capable of upholding the integrity of the Buddha’s teachings than us – unless we are not true Buddhists, in the case of which, we would be letting the Buddhadharma down.